It had been nearly a decade since I got my head underwater in the macro abundant waters of Lembeh Straight…and I was gearing up to take a group of 10 divers on expedition to Lembeh Resort this past November. Once again I wondered if I would be wowed as much as the last time I had been there. And the answer was a definitive YES! I was definitely wowed…even more than ever as this place never disappoints! Lembeh Resort sits in the lush, green, peaceful hills of Lembeh Straight surrounded by nutrient rich waters, making it the perfect backdrop for an epic yet relaxing dive adventure. Located in Northern Sulawesi in Indonesia, Lembeh Straight is a true mecca for macro lovers. 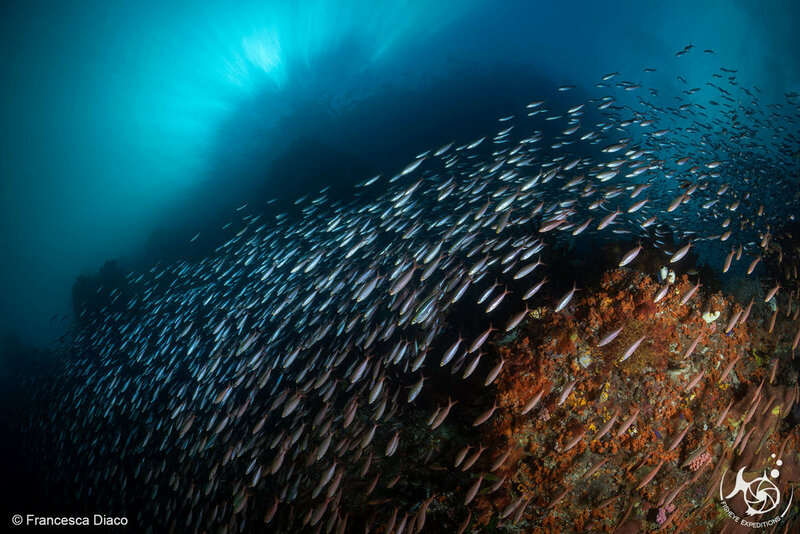 These nutrient rich waters are home to a never-ending list of all the hottest and rarest finds…and you often see many of them in just one dive! 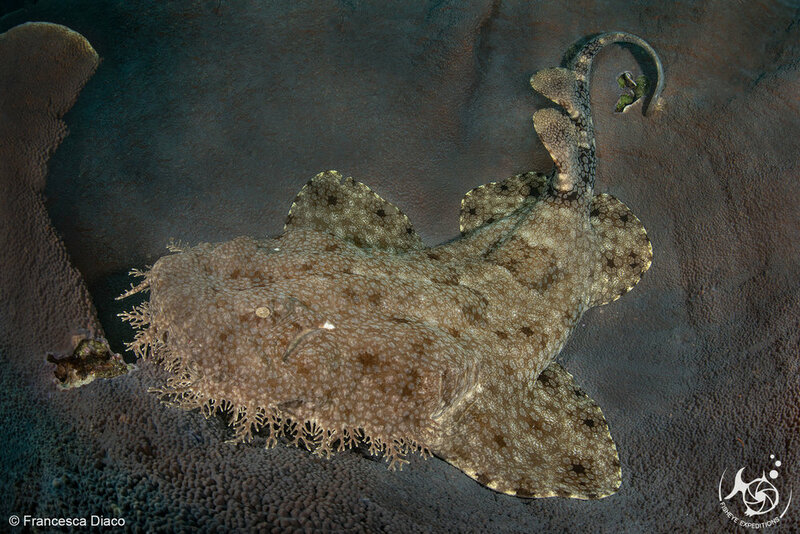 Minutes tick by like seconds and memory cards fill at a rapid pace as your guide points out wonderpus, flamboyant cluttlefish (mating! ), pygmy squid, hairy shrimp, frogfish of every shape and color and variety…and the list goes on and on! But don’t just take my word for it…check out this awesome video that our guest, Matti Oikarinen, shot during our trip. You will be dancing in your seat! Wonderpus…so mesmerizing to watch as they move through the water and change colors! For this group adventure, I chose Lembeh Resort, home of the reputable dive operation…Critters @ Lembeh (very aptly named). And from the diving to the food to the accommodation…it truly exceeded every expectation and then some. While the resort and dive center have been operational for a very long time, the resort has been recently renovated offering the perfect combination of comfort and style. Our group stayed in the luxury cottages, which were sublime….and very spacious. The rest of the resort facilities were also amazing. The stylish yet casual restaurant offers fresh, abundant buffets for breakfast and lunch and a multi-course a-la-carte dinner. And the food is out of this world! There are loads of healthy choices but everything is so delicious it is hard to say no to anything on offer — you will definitely not leave hungry! It is also a wonderful place to relax and chat…and have a coffee or a cocktail. The diving and camera facilities are spacious and well set-up, offering a comfortable and easy experience. There is a large camera room with individual stations and charging facilities conveniently located steps from the dive center, making it very easy to switch lenses and batteries in between dives. The dive sites are so close that you can come back to resort for surface intervals, which means you can charge batteries, grab a coffee, or even take a dip in the pool while you enjoy the view of the volcanoes in the distance. The boats are covered and spacious and have water and fresh towels on board for every guest. When you are not diving, there are so many places to relax and enjoy the lovely views from the resort. The pool area has tons of comfortable seating and a bar that serves specialty coffees, snacks and cocktails. And there is a full service spa with divine treatments (perfect for your no-fly day!). Ok I know, I know….enough about the resort and time to hear more about the diving! Well, Lembeh is best know for its volcanic black sandy slope muck diving. These gentle sandy slopes are a literal hotbed of activity and any underwater photographer’s dream (even a self-confessed wide angle addict such as myself!). Since there are only 3-4 divers per dive group, your guide is able to point out hot find after hot find after hot find. Sometimes they even puts sticks in the sand to mark where the cool critters are so you can move on to find the next critter and the next after you get your shots…making for an exceptionally fun underwater scavenger hunt! With so many awesome finds, every person in the group has a chance to work on their shots until you are ready to switch subjects. Heaven! Hairy Frogish are one of the hottest and most favorite finds in Lembeh. A Donald Duck shrimp (get it?) 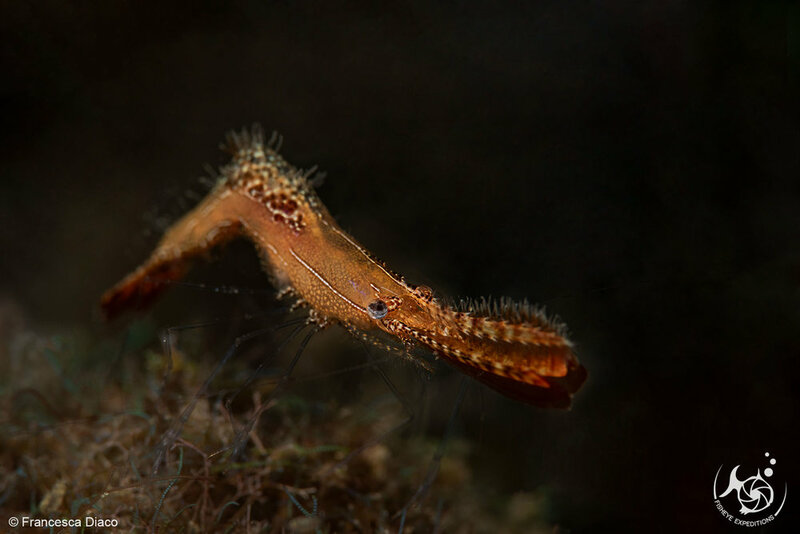 is one of the endless species of shrimp to be found in Lembeh. Dives are long and fruitful…and pass by in the blink of an eye. There is just so much to see and shoot. And they also have a resident Marine Biologist on hand to answer any of your questions and help you ID these crazy cool critters. But it is worth pointing out that there are also some beautiful surrounding reefs and options for some great day trips. Our group opted to take a full day trip to Bangka Island — we did two reef dives on the way, had an amazing lunch at Bankga Resort and then did another reef dive on the way back. It was an awesome day and a fun break from the muck. 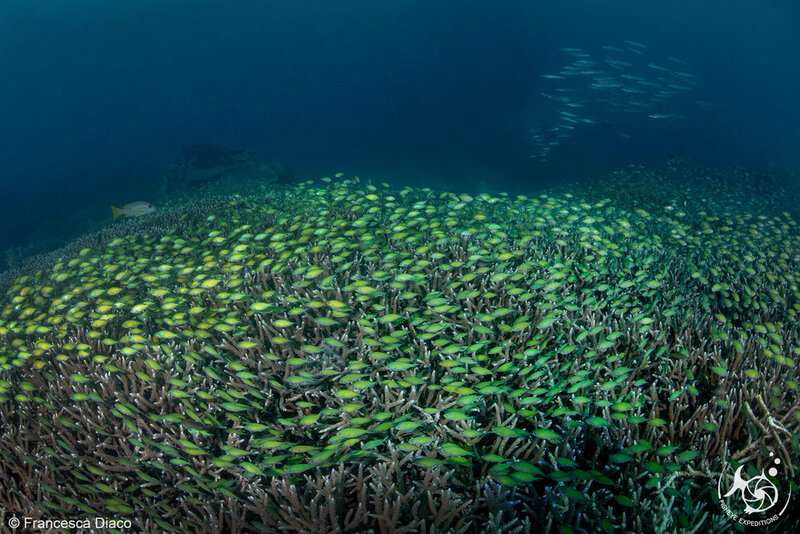 The biodiverse waters of northern Sulawesi also provide some exceptional reef dive and wide angle opportunities. Our group enjoying an awesome full day trip to Bangka Island including 3 dives and lunch at Bangka Resort. In the end our group had a fabulous stay at Lembeh Resort…so much so that we are the process of finalizing our next group expedition to Lembeh Resort in Nov 2020! It will run directly after our next Raja Ampat Expedition on the Indo Siren…making it an epic back-to-back trip extravaganza! As soon as we have the details finalized, it will be listed on our Expedition page and in our Newsletters. Fisheye Expedition’s 2018 Lembeh Adventure Team! And if you can’t join our group trip, it is also really great to know that we are booking agents for Lembeh Resort…and many other top rated resorts and liveaboards and can help you plan the perfect trip when it suits your schedule. Please contact me with your dates and diving wish list and I will be happy to help you Capture Your Next Adventure!! Also be sure sign up for the newsletter, which will keep you up to date on all of on all of our latest trip offerings, photo tip and great gear deals! Well sometimes the best laid plans get diverted….as was the case with this blog! But we are very happy to report that that it happened for all great reasons…like getting very busy with our amazing clients… and most notably the formation of a second business/sister company to Roatan Underwater Photography — Fisheye Expeditions & Photographic Services, LLC. Customized camera gear advice and sales — we are a dealer for Fantasea Line, SEA&SEA, Kraken, iTorch, Weefine, Beneath then Surface and more coming soon. Francesca will recommend gear that fits your goals and budget and will give you room to grow in your underwater photography journey. All orders will be directly drop shipped to your door. Customized dives and underwater photography expeditions to some of the world’s best and most exciting dive destinations. These trips, which are carefully curated and hosted by Francesca , are designed to offer the best, most rewarding and memorable dive and photography experience possible. Recent expeditions have taken us to some thrilling destinations including Anilao and Malaspaqua and the Visayas in the Philippines, Palau, Yap, and Lembeh and Raja Ampat in Indonesia. Next up…French Polynesia! And if you can’t make it on of our exciting groups trips, we are also a booking agent for many of the best resorts and liveaboards in the most exciting dive destinations around the world. Just let us know when and where you want to go and we will help you plan a trip of a lifetime! As of Jan 1, 2019, our Personalized Online Training Sessions are now offered through Fisheye Expeditions. For now we have been sharing websites with Roatan Underwater Photography but soon that will change…in the mean time check our Expeditions page for our exciting trip lineup…and new trips are being added all the time. Also be sure to check the blog for exciting news and trip reports.